I am always looking for a good holster. 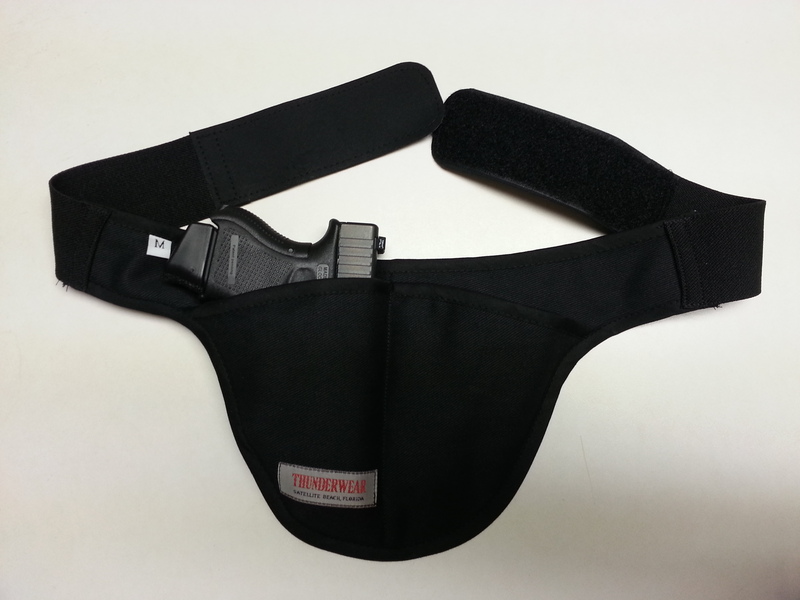 I put the standard model Thunderwear holster through a test and evaluation period to see how it performs. This holster was recommended to me by a co-worker. 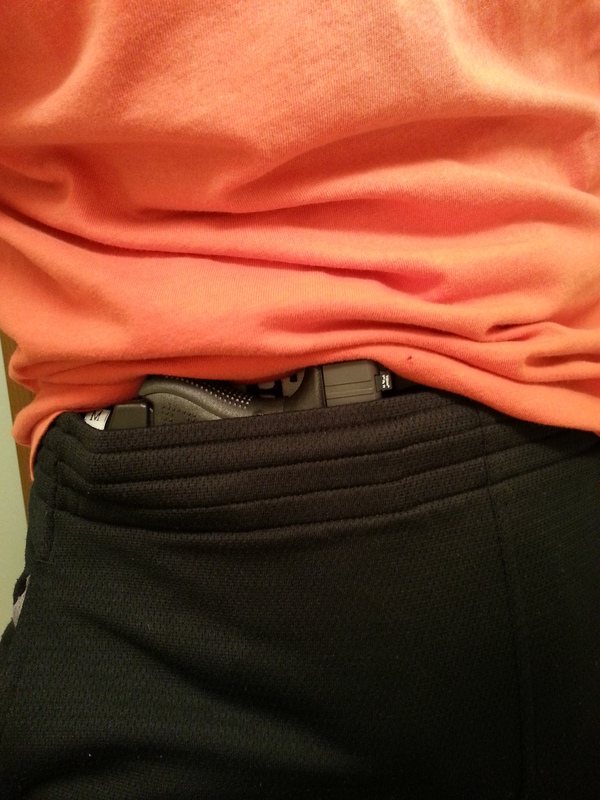 I am a big fan of inside the waistband holsters because they conceal well in nearly any type of attire. 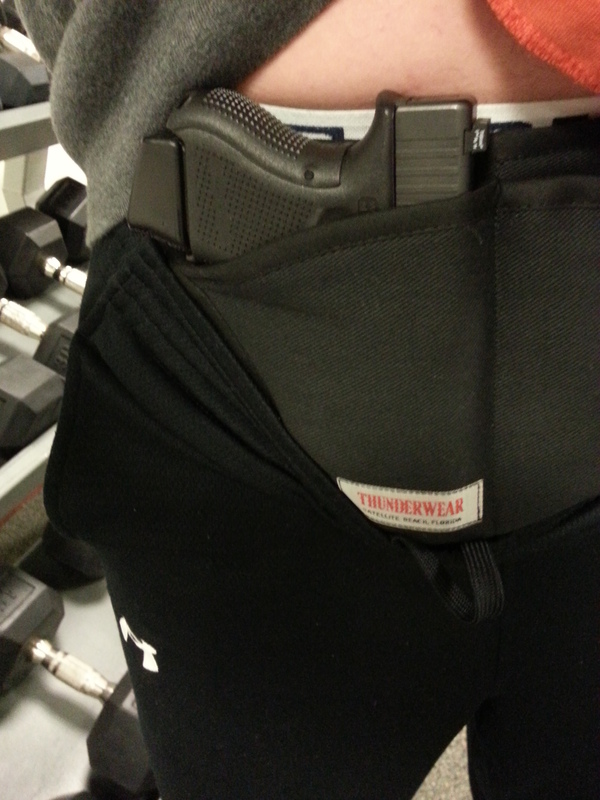 The reason behind testing Thunderwear is because I was looking for a holster that would be good to wear in gym clothes or loose fit clothing where other types of holsters are not suitable. Thunderwear offers different models, The Standard Model and The Combination Model. The standard model has two pockets, one for the gun and one for an extra magazine or whatever you decide to put in it. They claim the holster is made for the type of gun you specify. I found this to be false as they come in three sizes (small, medium, and large). 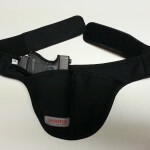 The combination holster also comes in three sizes (small, medium, and large). It is a three pocket holster that has two of the same size pockets in the front and a back pocket that is directly behind the front pockets. The back pocket is designed to carry cash, badge, handcuffs, etc. Out of the packaging, Thunderwear appeared to be constructed well. It is lightweight and constructed of double layered denim material with binding seams around the edges of the entire holster. 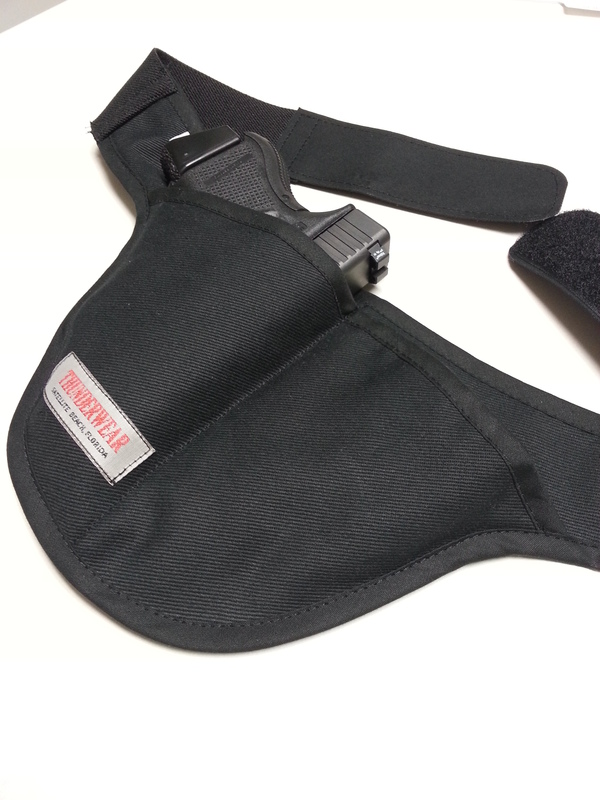 The back of the holster that goes against the body features a three layer moisture barrier. 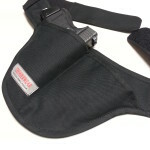 The holster attaches around the waist with a six inch Velcro strap. Thunderwear is designed to sit in over the groin area, which for me was different. I first put this holster on with gym clothes. 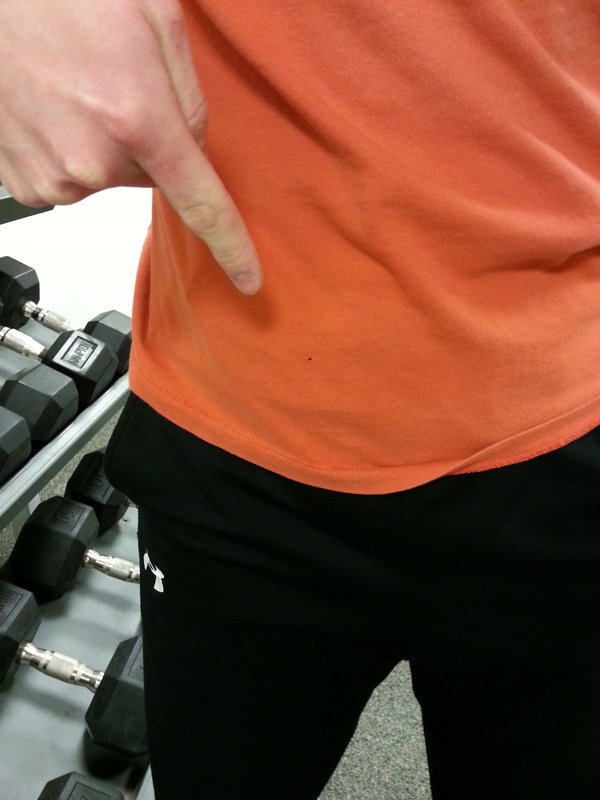 Under Armour All Season Gear workout pants and a t-shirt, to be exact. I was impressed with the ability to conceal a Glock 26 with +1 magazine extension. I asked some of the Blue Line Defense instructors if I was carrying a firearm, and they said no. 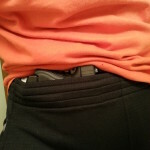 When I showed them, they were impressed at the holster’s ability to conceal my gun. I have not seen any retention issues with this holster. This would definitely be considered a level zero holster as there is no retention to it. The holster is what I would consider a pocket that the gun sits in. The only thing keeping the gun in the holster is gravity and the amount of pressure on it from the elastic around my waist from the pants I was wearing. 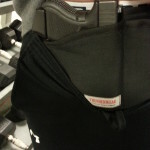 I did wear this holster while working out at the gym one evening and did not have any problems with it coming out. I have not tested it while running, but have a co-worker who carries in a Thunderwear when he goes running and said he has had no issues with retention. I was skeptical about the comfort of this holster, being that the gun sits in the groin area. The holster is cut so that it sits comfortably over the groin area. If you are not used to carrying in a inside the waistband holster, this holster may not be for you, but if you prefer this type, then this holster is worth a shot. My biggest concern with this holster is that it is not ridged, at all. Especially since it sits over the groin area, I believe there should be some rigidness to it to prevent the trigger from being pulled through the soft denim material. With that being said, it would take some effort and pressure to pull the trigger while the gun is in the holster. I just prefer holsters with hard material around the trigger guard to assure me that there is absolutely no way the trigger could be pulled. As I mentioned, it is a soft holster, so it will not hold its shape when the gun is drawn. This makes holstering a two handed job, which I am not a fan of. Thunderwear is a very affordable holster, priced from $44.95 for the standard model and $59.95 to $69.95 for the combination model. The Good: If you are looking for a comfortable deep concealment holster, Thunderwear is where it is at! The Bad: If you choose to carry in this holster, I would be mindful of the safety issues that I addressed. Overall, this is a good holster for deep concealment at an affordable price.